Eyes are the interface between the outside world and our brain's perceptions. Being the instrument of sight, and therefore a lot of our information, we rely on the functions of our eyes quite obsessively, and why wouldn't we? They make it possible to observe our beautiful world and really appreciate different species and the unique characteristics they hold - like their eyes. Since eyes do not fossilize very well, we cannot exactly depict the changes in eyes as we can with the evolution of, let's say, legs and what not. What scientists can do, and what they have done, is re-create the most likely plan of the evolution of eyes. This includes the development of light sensitive cells which, over thousands of generations and under the guidelines of natural selection, allowed the development of the eye. Sounds simple? Not quite. There are no 100% accurate models for the eye, though scientists believe they have come close. One of the best explanations derive from the first animals that have what resembles an eye. These creatures lived about 600 million years ago, with not so much an eye as light-sensitive genes called "opsins". 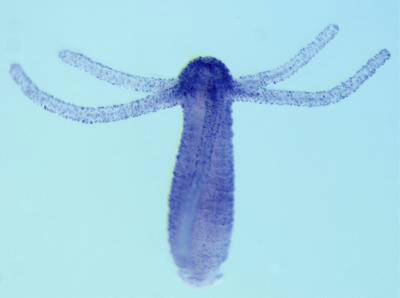 The Hydra is a freshwater cnidarian similar to corals and jellyfish. It's body is coated with opsins, which scientists believe gave it an advantage in capturing prey, and keeping its distance from predators likewise. With the discovery of this animal, latest researches are naming it the possible origin of vision. Hydras have no eyes or light-receptive organs, but they have the genetic pathways to be able to sense light, allowing scientists to more accurately model the evolution of the eye. The basic eye is anything but basic. Instead, it is very complex, constantly adjusting to surroundings and to the amount of light it lets in. Though the intricate workings of an eye contain several components, the ones we'll discuss today are the pupil and the iris. The pupil is the point in which light enters the eye and results in the mind conjuring an image. The larger the pupil, the more sunlight shines through. The evolution of the pupil lies in the idea of "survival of the fitter", better known as Darwin's Theory. Differences in circumstances and in surroundings determine not only mundane physical characteristics, but how we use our eyes as well. 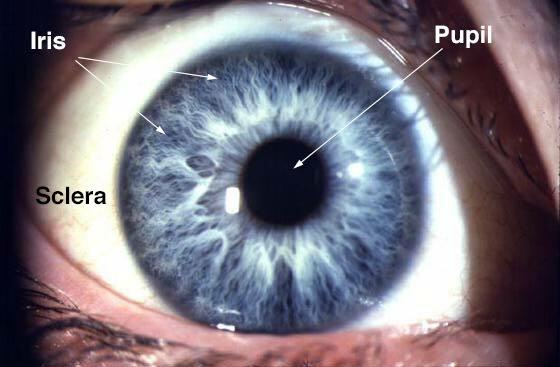 The pupil is involuntarily controlled by the iris, which constricts and dilates in order to regulate the amount of light that enters the cornea. The iris is the control center for light, controlling how much is let into the eye. When there is an abundance of light the iris adjusts by shrinking, allowing just enough light to be absorbed. Under darker circumstances, however, the iris expands to allow maximum light to be absorbed. The function of the iris is great proof of evolution by clearly defining which animals would survive better. Animals whose eyes could adapt to lighting variations could easily and under any circumstances avoid predators, and thus pass those genes on. Variations in the structure of the eye have happened throughout evolutionary history. What causes these Differences? Why, Natural Selection, of course! Spherical: This is the typical pupil seen in the human species as well as in primates, canines, and the just of the animal kingdom. This type of pupil adapts well to the intensity of light during the day, though isn't necessarily proficient during nighttime outings. Useful in broad observations of carnivores and like predators. 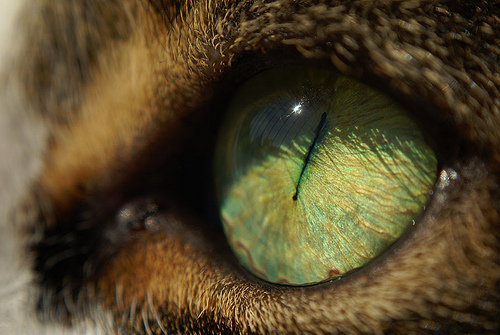 Vertical Slit: Cats, many species of snakes, alligators and crocodiles possess these eyes. Although these types of pupils are a useful adaptation for nocturnal animals, the animals who usually have them are both active day AND night. Because of their exposure to daytime lights, this pupil allows protection of the retina in daylight glare. 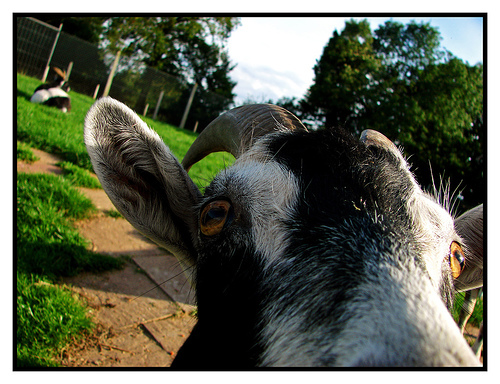 Rectangular: Sheep, Goats, Octopuses and Toads have these rectangular shaped pupils. Typically classified as prey, these animals need to have a defense both day and night. But they don't have vertical slits due to their need to survey their surroundings more accurately. The narrower the pupil in relation to the horizon, the greater the accuracy of depth perception is in the peripheral vision of the animal. The perception of depth must be considered with these animals who spend their time evading predators in a rugged terrain.